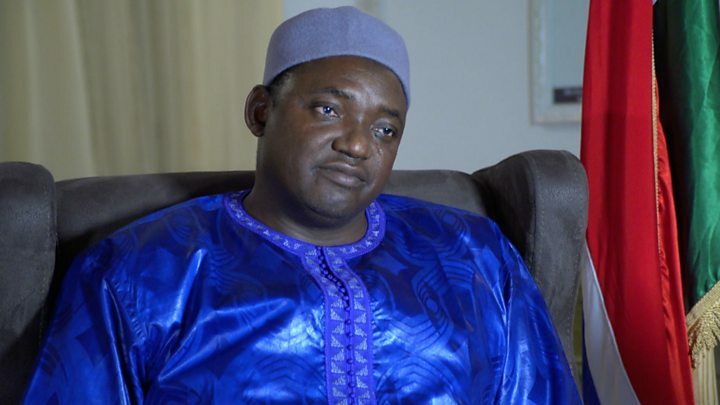 The winner of December's presidential election in The Gambia says there is no need for President Yahya Jammeh to seek asylum and he is confident direct talks can solve the crisis. Adama Barrow told the BBC he was confident he would be sworn in next week despite his rival's refusal to give up power. Nigeria's leader has flown to Banjul to try and broker an end to the deadlock. His MPs have voted to offer Mr Jammeh asylum to help negotiations. Mr Jammeh's term officially ends next Wednesday, but he wants the results annulled after the electoral commission admitted some errors, although it insists this did not affect the final outcome. The African Union has said it will no longer recognise Mr Jammeh as president after his term of office expires. The 51-year-old leader, who initially accepted defeated in the 1 December poll, seized power in the tiny country in 1994 and has been accused of human rights abuses, although he has held regular elections. The Supreme Court is unable to hear the challenge until May because of a shortage of judges, and Mr Jammeh says he will not step down until then. Foreign leaders from regional bloc Ecowas, led by Nigerian President Muhammadu Buhari, have arrived in The Gambia to again try to persuade Mr Jammeh to step down on schedule. The grouping has warned that it would consider removing him using military force if he refuses. But Mr Barrow, a property developer, told the BBC's Newsday programme that he would prefer a "peaceful transition". He said he welcomed the move by Nigeria MPs to offer Mr Jammeh asylum, but said he did not feel the situation would "get to this level". "We want to keep Jammeh in The Gambia, I don't think there's any need for him to go to another country." He called on Mr Jammeh to "respect the constitution" and engage in direct talks. "We solve our problems within ourselves without the intervention of anybody. I think that's what we'd prefer," he said. A lawyer for Mr Jammeh on Thursday filed a request with the Supreme Court asking for an injunction to block Mr Barrow's swearing-in. Mr Barrow won 43.3% of the vote compared with Mr Jammeh's 39.6%. A third candidate, Mama Kandeh, got 17.1%. Gambia election crisis: What next for Jammeh?